As part of FIRIS’ ongoing commitment to provide parents and caregivers with information regarding Real Christian SRE rather than leaving them to make their decisions based on the sales-pitch offered by Christian SRE providers, we will continue our exploration of the Firm Foundations scripture materials. Neither the NSW Minister for Education nor the Department of Education have authority over what is taught in a SRE classroom, how it is taught, or who scripture providers authorise to deliver it. The Department of Education relies on nothing more than an ‘annual assurance’ from providers that their SRE instructors are using the provider’s authorised ‘age-appropriate‘ curriculum ‘with sensitivity and in an age appropriate manner‘. The Firm Foundations curriculum was declared age-appropriate and authorised for use by the Fellowship Baptist Church of Blacktown for use in NSW public schools in its 2018 Annual Assurance. Let’s now begin to see what the Firm Foundations lessons have to say about blood and animal sacrifice. 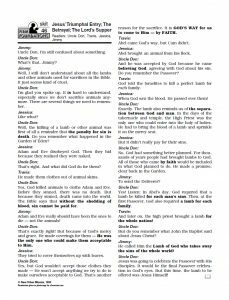 At the end of Book 2 children learn about the first blood sacrifice for sin, that is, ‘God’s gracious act of clothing Adam and Eve‘. The theme returns in Lesson 13 in Book 3. The children are told that the ‘Bible clearly says that blood must be shed for sin’ and that Abel brought one of his lambs, the firstborn of its mother, killed it so ‘its blood ran out‘ and offered the sheep, along with the fat, to God. 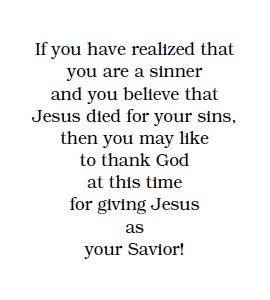 Because he agreed with God that he was a sinner. And he believed that only God could save him from everlasting punishment. It is important to understand that the blood of animals could never pay for sin. God did not accept Abel’s lamb as the payment for his sin. But God forgave Abel’s sin and accepted him because Abel trusted, not in himself, but in God who had promised to send the Deliverer. The theme of animal and blood sacrifice in the context of having faith in order to please God is found in Lesson 18 regarding Abraham and Isaac. Once again, the stuffed toy lamb is to be at hand. 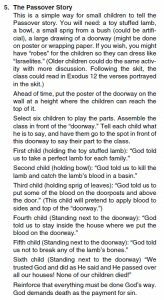 The children are asked to consider Isaac’s situation and to remember that he had most likely seen many sacrifices (‘SHOW THE STUFFED TOY LAMB‘). 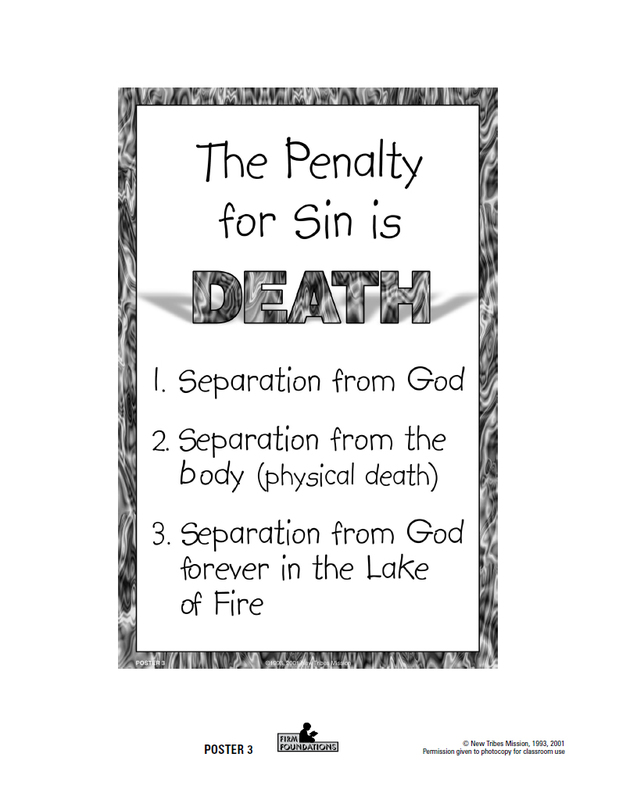 Is there any way that we can save ourselves from death and everlasting punishment for our sins? No! We cannot save ourselves. God will punish all sin. No one can escape from God. God and only God can make a way to escape. Do you know what God did for Isaac? Because Abraham had not brought sheep with him as a suitable sacrifice, God ‘graciously’ provided a ram which could be sacrificed in place of Isaac. 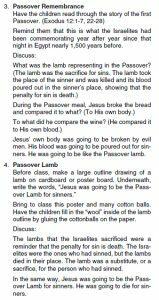 Animal and blood next appears in the Firm Foundations materials in Lesson 22 as the children learn about God passing over Israel. Once again, the ‘realistic, stuffed, toy lamb‘ is required as a visual prop. After hearing about the nine plagues sent by God the students are told that God warned Moses that ‘the Israelites must prepare for the final and most terrible plague of all‘, a plague that would destroy the firstborn in the Egyptian homes. What do you think would have happened if an Israelite had said, “It’s a shame to kill this good lamb. I won’t kill it. I will just tie it up at the door. God will see the living lamb, and He will not kill my child by the plague.” Do you think God would have passed by the firstborn of that house? No! The lamb had to die. The blood must be shed. They must not forget that the punishment for sin is death. 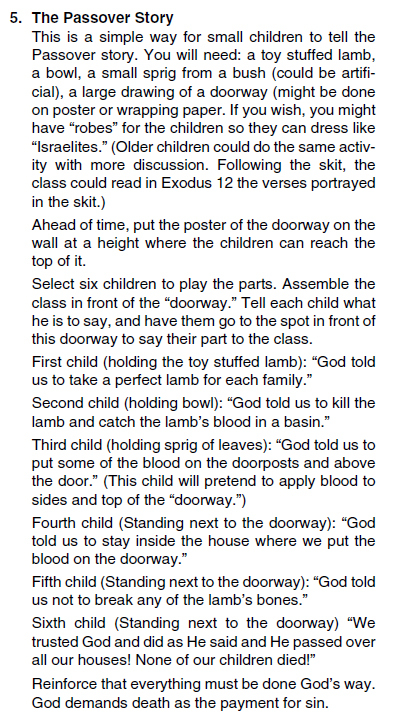 Given that NSW public school teachers do not have to remain in the classroom while SRE is being held, who knows what actions children are encouraged to carry out as they re-enact the Passover Story. 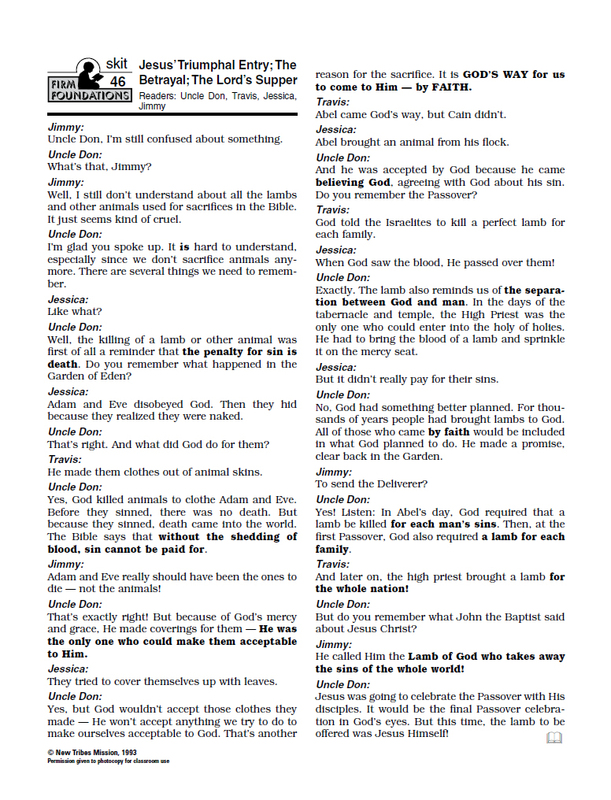 Animal and blood sacrifice appears in Lesson 26 of Book 4 as children learn about the role of animal and blood sacrifice in the Tabernacle. 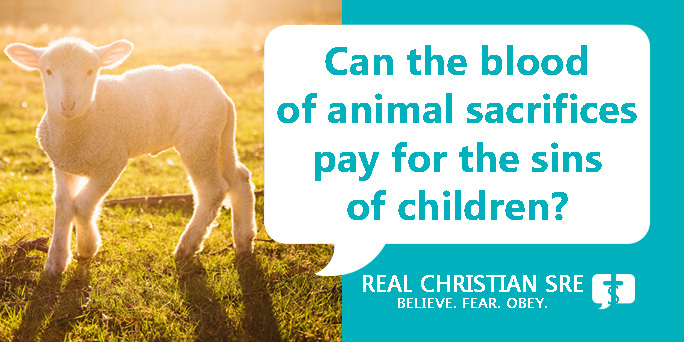 Could the blood of animals pay for their sins? No! 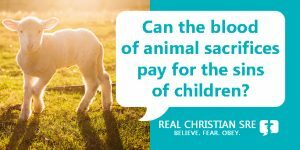 The blood of the animals could not pay for their sins. 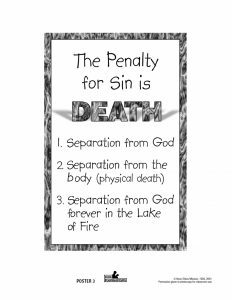 — The punishment for sin is death, and that includes the sep­aration of the sinner from God forever. — Sin must be paid for in full. The Israelites were never to forget that they were sinners, that God is perfect, and that the punishment for sin is death. Because the blood of animals could not pay for their sin, the blood had to be placed before God every year. 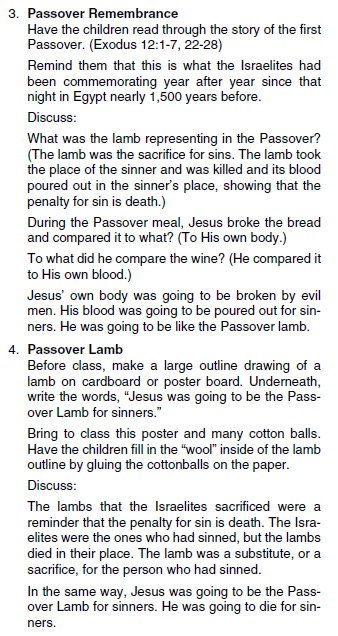 Well, I still don’t understand about all the lambs and other animals used for sacrifices in the Bible. It just seems kind of cruel. – and Uncle Don concludes by reminding Jimmy and Jessica that Jesus was the final lamb to be offered as part of the Passover sacrifice. 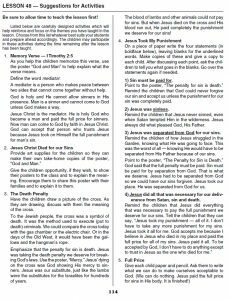 Lesson 49 in Book 5 presents the meaning of Christ’s death from the Old Testament. 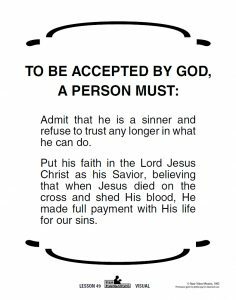 How then must a person respond to God in order to be accepted by Him? – and if, after their journey through the blood-soaked account of the scriptures presented in the Firm Foundations materials, the instructor and Christian SRE can declare their ‘Mission accomplished’. After three years of correspondence with both the previous and current Minister for Education and the Department of Education, FIRIS has exhausted all formal and bureaucratic means to have the Minister include a simple but very important statement in the Religious Education Implementation Procedures. Not only has the Minister granted the scripture lobby’s wish to have a declaration of ‘no religion’ on the enrolment form ignored, he has also chosen to not make the necessary amendments which would ensure students are not placed in scripture classes without express consent from parents and caregivers. See here for a detailed discussion of the history of the history of the changes to the enrolment processes. – to the risk of being placed in a scripture class ‘deemed most suitable’ if the SRE Participation Letter was not returned. Given that the Minister has still not made the necessary changes to the Procedures and its supporting documents, FIRIS has decided to take more direct action to try and prevent students being exposed to this risk in 2019. Today FIRIS started forwarding the letter below to every public primary and secondary school principal in NSW to directly inform them about the important step in the enrolment process which the Minister and the scripture lobby do not want them to know about. FIRIS is now calling upon its supporters to help us to bring this matter to the attention of every Parents and Citizens Association active in a NSW public school. FIRIS would like to enable P&Cs to take the necessary action to ensure that the rights and choices of all students and their parents and caregivers are respected and that schools are following the Minister’s and the Department’s procedural advice contained in the letter. Request that this issue be placed on the agenda for the next meeting, and present the letter in person and put forward a motion requesting that the principal ensure that the rights and choices of all students and their parents and caregivers are respected. FIRIS would also liked to be informed of the outcome. 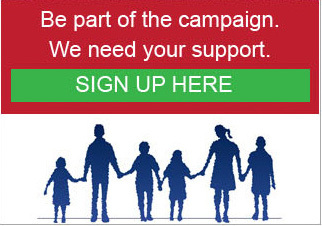 For non-NSW supporters wanting to help, please send an email to FIRIS and we can let you know how you can support us. 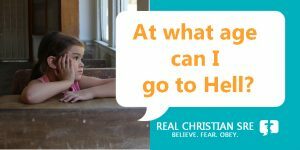 It is time to make it very clear – When it comes to scripture in Australian public schools, it is not a ‘yes’ if it is not a clear and informed ‘yes’. Last month the NSW Opposition leader Luke Foley announced that Labor wants to make it easier for parents to choose between scripture (aka ‘special religious education’ or ‘SRE’), ethics (aka ‘special education in ethics’ or SEE’) classes or neither (aka ‘alternative activities’) in NSW public schools. ….go back to the [enrolment] form that was in use before the Liberal-National government changed it. Allow parents to just tick the box, without the need to write additional letters – or creating more confusion. The Minister for Education, Rob Stokes, is reportedly ‘pleased that Labor supports our view’ and has claimed that he has spoken to the Department of Education’s Special Religious Education Consultative Committee (the SRE-CC – mainly made up of religious organisations) and they have indicated that they too are happy for the enrolment form to change. 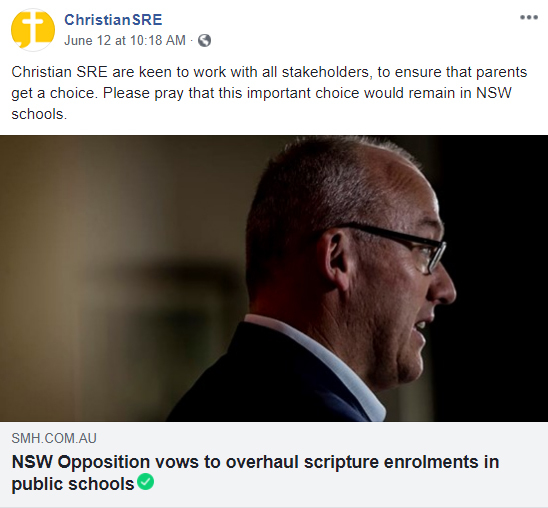 So, it seems ‘choice’ is the mantra with both sides of NSW politics and scripture providers all eager to declare their respect for the rights of all parents and caregivers to choose between scripture, ethics, or alternative activities. Therefore, FIRIS believes it is timely to make public the results of more than five years of tracking changes to the enrolment process, corresponding with the Ministers for Education and the Department of Education and using NSW’s freedom of information law to get important documents such as the minutes of the SRE-CC. What FIRIS has found reveals a a very different picture to the one painted by the Minister and the scripture lobby when it comes to a respect for the choices of all students and their parents/caregivers..
We will start by looking at the SRE-CC and what its members’ past actions and statements can tell us about their respect for parent/caregiver choice. In particular, we will consider the statements and actions of the scripture lobby’s most frequent spokesperson, Murray Norman. Murray is the Presbyterian Church’s representative on the SRE-CC, a board member of the pressure group, the Inter-Church Commission of Religious Education In Schools (ICCOREIS), the CEO of ChristianSRE (an offspring of ICCOREIS) and the Deputy Chair of Generate Ministries, the main employer of scripture instructors in NSW secondary schools. See here for a full transcript of the interview on Hope 103.2 FM (14 March 2018). But alas, when we consider the scripture lobby’s response to the first roll-out of the enrolment form that Labor is now proposing we return to, all is not what Murray would have us believe. The controversial version of the enrolment form including the option of ethics was originally released in June 2014. On 10 November 2014 Murray Norman sent an email with attached documents to Dr David Cullen, then the Department’s Director responsible for scripture and ethics. The documents outlined the scripture lobby’s desired changes to the enrolment form above and enrolment processes. Dr Cullen then forwarded Murray’s email and its attachments to all members of the SRE-CC with the statement – ‘Murray Norman will be talking to these documents at our meeting tomorrow’. The minutes for the Committee meeting on 11 November 2014 record these documents as having been tabled and discussed. The table in the attachment to Murray’s email named ‘141106_DEC Enrolment Form Procedure.docx’ states very clearly how the scripture lobby on the SRE-CC wanted the enrolment process to work. The SRE Participation Letter had been introduced by the Department earlier in 2014 in response to Recommendation 12 of the Final Report of General Purpose Standing Committee No 2, Education Amendment, (Ethics Classes Repeal) Bill 2011. What is important to note at this point is that the table above indicates a declaration of ‘no religion’ or ‘none’ was no longer regarded by the scripture lobby on the SRE-CC as evidence that a parent/caregiver was objecting their child receiving religious instruction. In response to such a declaration, the scripture lobby wanted the SRE Participation Letter sent home listing the available scripture options at the school and providing parents/caregivers with the option to withdraw (most likely for the second time). The inclusion of ‘no religion’ is to prejudice or bias the results by suggesting a category and thus to skew data collection. As the question is now optional, the fact that the parent or caregiver writes something indicates an existing religious awareness or preference. – but more on this later. Now this is where it gets very interesting and where the smokescreen mantra of choice clears and the lack of respect for the rights and choices of a large number of students and their parents and caregivers is exposed. What to do if the SRE Participation Form was not returned? This question is important because the answer will make clear the Department’s default position regarding the scripture enrolment process. Is it the case, that in the absence of a clear direction from parents/caregivers, the Department’s default position is that the children of such parents are placed in a scripture class? Or, is the default position to place such students in alternative activities thereby respecting and protecting the rights of such students and parents as outlined in international human rights instruments? It is clear from the attachments to Murray Norman’s 10 November 2014 email what he and other members of the scripture lobby on the SRE-CC wanted. Once again, the table in attachment 141106_DEC Enrolment Form Procedure.docx is very revealing. If the SRE Participation Letter was not returned, the student was to be ‘enrolled in the SRE program deemed most suitable‘. If no preference is indicated, the school will enrol your child in the SRE program deemed most suitable unless the school is informed otherwise by you, as the parent/caregiver. When the school has informed parents/caregivers of the options for special religious education and the parents/caregivers have not exercised their right to select an option, the student is enrolled in the Special Religious Education class deemed most suitable. It’s not actually for the churches or the SRE providers or the principals to choose where they go, it’s up to the parents. Many parents and caregivers may be confused about who the scripture lobby expects to be doing the deeming if the SRE Participation Letter is not returned. One thing is certain though, it is obviously not the parents or caregivers. However, you might be thinking at this point that these were only the suggestions of the scripture lobby on the SRE-CC. Therefore, let’s now have a look at what the previous and current Minister for Education, and the Department have done in response to these suggestions. In December 2014 the REIPs were changed. Where a religious persuasion was not nominated, the student is placed in alternative activities. The REIPs also now included a reference to a letter template – the SRE Participation Letter – to be used to offer parents/caregivers ‘the available special religious education options, where a religious persuasion was not nominated on enrolment.’ However, neither the REIPs nor any of its supporting documents said what a school should do if a parent/caregiver chose to leave the SRE Participation Letter blank or if it was not returned at all. Based on information obtained using NSW’s freedom of information law, it appears that in response to a complaint from an unknown person about the impact of the new enrolment form on the number of students enrolling in scripture and direct involvement and pressure from the NSW Premier’s office, in mid-December 2014 a memorandum to schools was issued to all public school principals. The memorandum directed principals to send the SRE Participation Letter to all parents of students enrolling in Kindergarten or Year 7 for the 2015 school year but did not say what a principal should do if a parent/caregiver chose to leave the SRE Participation Letter blank or if it was not returned at all. It is important to note that both information about SEE where it is available and an offer for parents/caregivers to nominate for their child to attend SEE should not be made until a parent/caregiver has formally withdrawn their child from SRE. The minutes of the 11 November 2014 SRE-CC meeting also made it very clear that the scripture lobby were not prepared to tolerate ethics being ‘set up against‘ scripture. The attachment to Murray Norman’s 10 November email (141106_Issues with SRE – compiled.docx) also demonstrates that the scripture lobby took issue with ethics and scripture ‘being offered together as equal options‘. 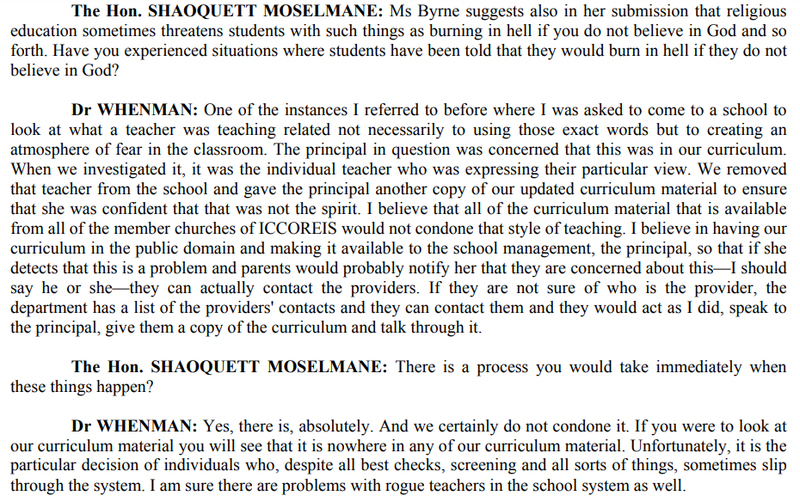 Where a religious persuasion was not nominated on enrolment, or the nominated religious persuasion is not available as a special religious education program at the school, parents/caregivers are informed of other special religious education options available at the school. 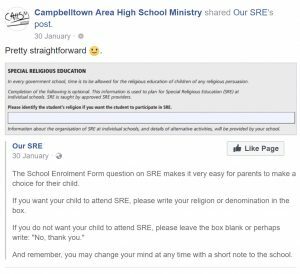 Once again, there was no statement about what was to happen if the ‘special religious education preference form’ – the SRE Participation Letter – was not returned or was returned blank. 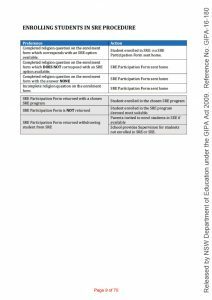 So it seems the Department granted the scripture lobby and thus the SRE-CC’s wish that the SRE Participation Letter be sent home in response to an ‘Incomplete religion question on the enrolment form’ (see the first table above ‘141106_DEC Enrolment Form Procedure.docx’). In August 2015 a complaint was sent to the Department regarding these amendments to the REIPs. It was pointed out to the Department that the removal of the explicit direction to place a student in alternative activities if a scripture class was not nominated on the enrolment form enabled schools to place a child in scripture without the express consent of the students parents/caregivers. Furthermore, it was pointed out that in the event of this happening, parents and caregivers could not appeal to the REIPs as part of a complaint. The complainant requested that evidence that the letter had been tabled and discussed at the next meeting of the SRE-CC be provided along with an outline of any actions to be taken in response to the complaint. Schools follow their normal procedure if a parent does not return their preference for a SRE class or to withdraw their child from SRE. Recommendation 41 from the Rawlinson Report 1981 states that a parent must notify the school of changes in enrolment or intended withdrawal in writing. Nonetheless, Dr Cullen wrote that the complainant’s comments had been taken on notice and would be considered in any future review of the REIPs. He also confirmed that the complainant’s letter and concerns had been added to the agenda of the next SRE-CC meeting. Therefore, we can assume that those present at the SRE-CC meeting on 10 November 2015 were made aware of the contents of the complainant’s letter and the concerns that the rights of students and their parents/caregivers were being violated. Early in October 2015 the current version of the enrolment was released. The choice was supposedly simple – parents and caregivers seemed to have the option to identify the student’s religion if they wanted the student to participate in scripture and also the option to leave it blank which one would assume would be enough to be saying ‘no’ to scripture. It should be noted that is how it has been explained by Christian scripture pressure groups, such as Generate Ministries. 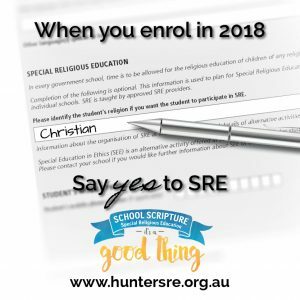 Because the REIPs current at the time said that if parents did not complete the section of the enrolment form related to scripture they were to be sent the SRE Participation Letter. Furthermore, those REIPs still failed to include a statement about what was to happen if parents/caregivers did not return the SRE Participation Letter or returned it blank. However, the seeming lack of respect for the rights of all students and their parents/caregivers does not end there. Despite being made aware of potential violations of the rights of a large number of NSW public school students and their parents and caregivers, not only did the Department and the SRE-CC choose to not make the REIPs more robust, they chose to increase the number of students at risk of having their rights violated. In April 2016 the Department granted yet another significant wish of the scripture lobby on the SRE-CC. 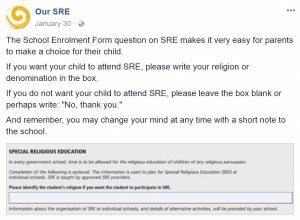 Even though the Department had removed the prompt to write ‘no religion’ from the October 2015 enrolment form, the choice of parents who used their own initiative to do so was now to be ignored. 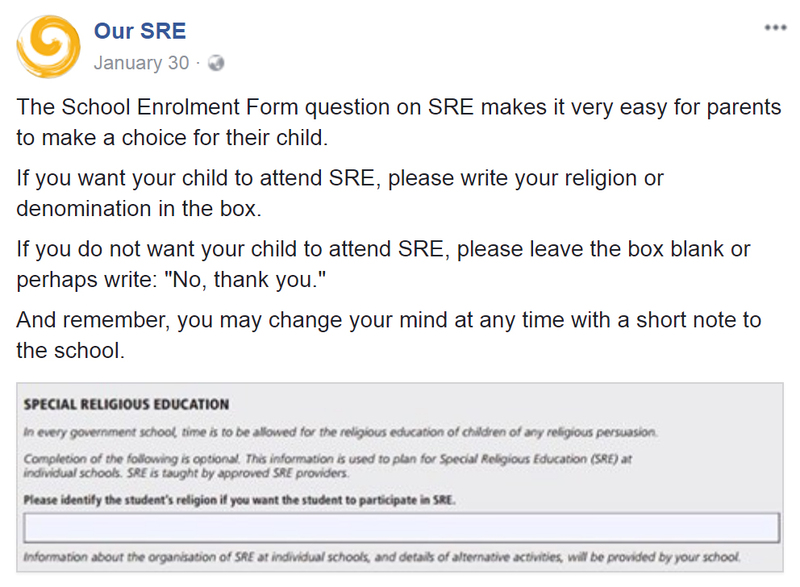 A declaration of ‘no religion’ in response to the question ‘Please identify the student’s religion if you want the student to participate in SRE’ was no longer to be regarded as an indication that the parents or caregiver did not want their child to participate in scripture. The parent/caregiver has written ‘no religion’ on the enrolment form → Student engages in meaningful activities during SRE time. There was, and still is, no statement in either document about what is to occur if the SRE Participation Letter is not returned or if it is returned blank. The only statement in the flowchart relating to the non-return of a form/letter is in reference to a parent/caregiver not returning the letter offering them an opportunity to enrol in ethics SEE. Only if that letter is not returned is the specific direction given to place the student in alternative activities. The sending of the SRE Participation Letter to parents and caregivers who have already declared ‘no religion’ or ‘none’ thereby requiring them to opt-out again is an unjustified and unconscionable act by the Department. By doing so, the Department has significantly increased the number of students at risk of being exposed to the religious instruction of others without express consent from parents/caregivers, and in many cases contrary to the expressed wishes of their parents and caregivers. 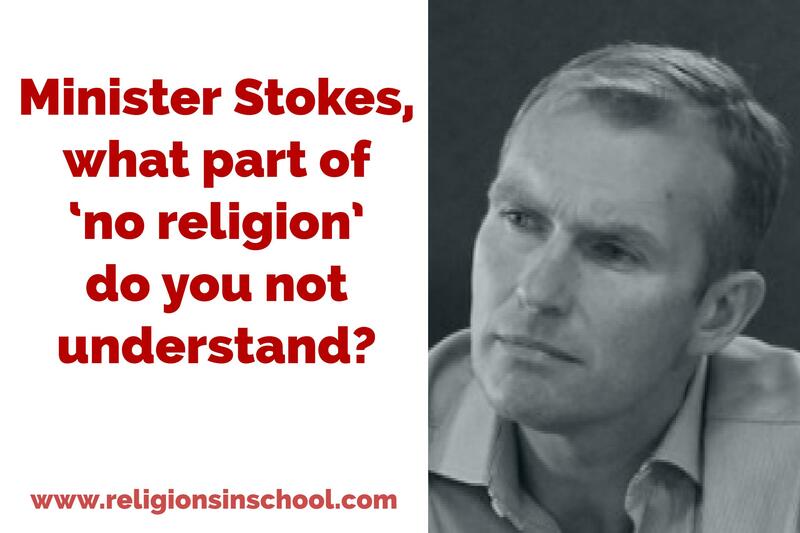 What part of ‘no religion’ do the Minister and the scripture lobby not understand? In consideration of the information above, in September 2017 FIRIS sent a letter of complaint about the enrolment processes to the Minister for Education. In addition to the issues raised immediately above, FIRIS also pointed out that from April 2016 onwards both the Principal Checklist – SRE and SEE and the SRE–SEE–VSA FAQs did not, and still do not, tell parents and caregivers what happens if the SRE Participation Letter is not returned or if it is returned blank. After waiting 6 weeks for an answer, and following advice from the NSW Ombudsman, FIRIS wrote to the Secretary of the Department of Education, Mark Scott, and asked the same question. If the SRE participation letter to parents/caregivers is not returned, it is expected that the school would made all reasonable attempts to seek a response from the parents/caregivers regarding whether the student participates in SRE at the school. 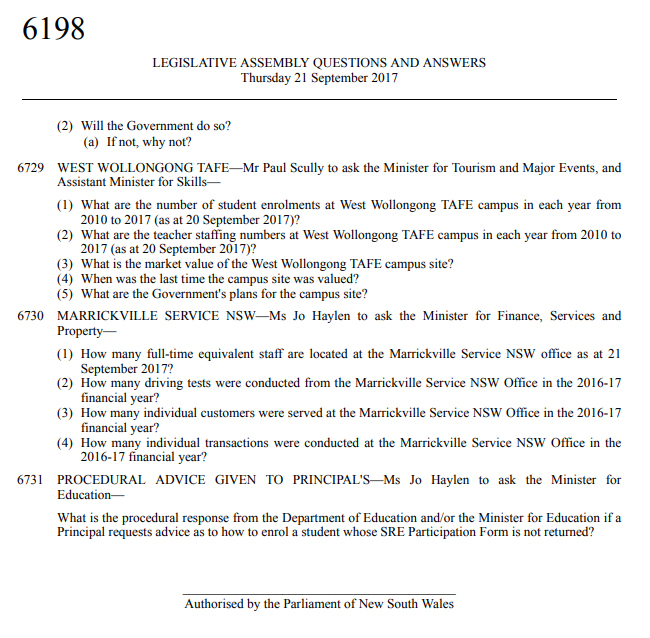 What is the procedural response from the Department of Education and ⁄ or the Minister for Education if a Principal requests advice as to how to enrol a student whose SRE Participation Form is not returned? Now a reasonable and principled member of the NSW public might think that since both the Minister and his representative have finally clearly stated what is to happen if the SRE Participation Letter is not returned they would make sure that the REIPs were amended accordingly. – were exposed to the risk of being placed in a scripture class ‘deemed most suitable’ if the SRE Participation Letter was not returned or returned blank. 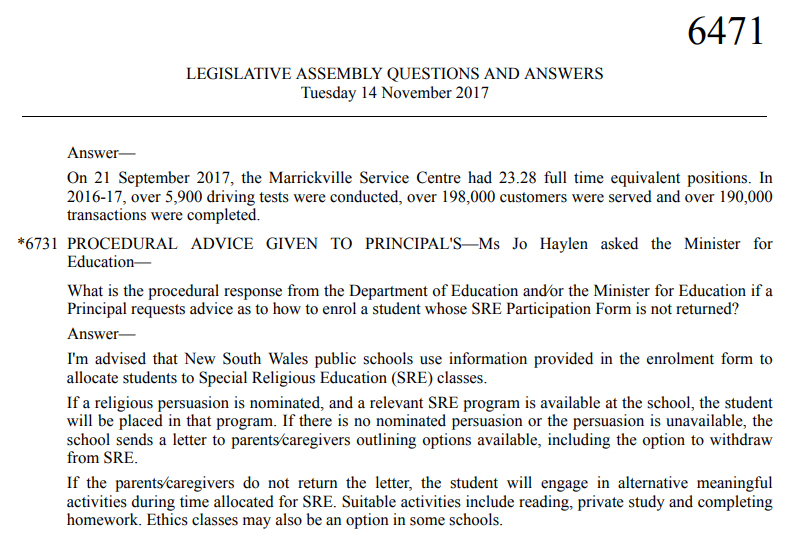 Furthermore, those students whose parents/caregivers nominated a religious persuasion not available at their school were also exposed to this risk, particularly the 105,556 students that had a specific religious persuasion declared on their enrolment form for which there was, and is, no available scripture provider in NSW Government schools approved by the Minister. In February 2018, in consideration of the fact that the REIPs had not been amended prior to the beginning of the 2018 school year FIRIS wrote another letter of complaint to the Secretary of the Department, Mark Scott. FIRIS was also alarmed that proposed Special Religious Education Procedures scheduled for implementation on 30 January 2019, also did not contain measures to protect and respect the rights of all parents and caregivers and referred to documents which had not been amended in consideration of the Minister’s response to Jo Haylen. Compare this letter word for word to the one received by FIRIS from Rod Megahey mid-November and note the glaring omission. If the parents/caregivers do not return the SRE participation letter, the student will engage in alternative meaningful activities during the time allocated for SRE. 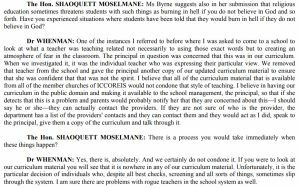 Needless to say, at the time of writing (6 July 2018) neither the current REIPs (dated December 2016) nor the proposed 2019 Procedures or any of the supporting documents have been changed to reflect the Minister’s responses to Jo Haylen or his Department’s response to FIRIS. So what does all of this reveal about those rushing to declare their respect for parent and caregiver choice now that NSW Labor has made the enrolment form an election issue? It seems the Minister is OK with parents and caregivers having a choice, but it seems he is not so interested in ensuring that that choice is respected, protected and acted on in with any integrity by his Department. The history of the changes to the enrolment process reveals that the senior Department of Education representatives have amended policies and procedures resulting in the increased risk of the rights and choices of a significant number of students and their parents and caregivers being dismissed at the school level and violated. In consideration of the audits completed by FIRIS demonstrating the failure of the Department to monitor scripture in any meaningful way and the failure of far too many scripture providers to fulfill their obligations in a self-regulating system, the failure of the Department to develop robust policies and procedures exposes it to the risk of failing to fulfil its duty of care obligations by minimising the risk of students being exposed to the content of scripture lessons and the actions of scripture instructors without express and informed consent from parents and caregivers. 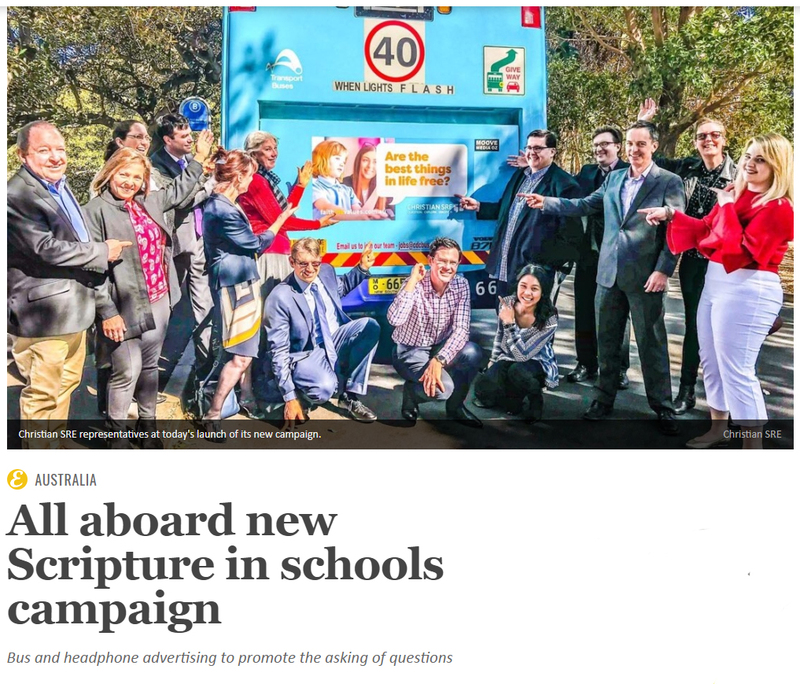 at worst, a deliberate dismissal of the rights and the choices of a significant cohort of the NSW public school community with the intention of increasing the chance of students being funnelled into scripture classes without express and informed consent from parents and caregivers. Given that FIRIS has exhausted all formal and bureaucratic channels to have the Minister ensure that the rights of all students and their parents/caregivers are respected throughout the enrolment process, we are in the process of seeking legal advice based on a 125 page document outlining the history of amendments to the enrolment process including 79 pieces of supporting evidence. Given that the Minister has chosen to not ensure that his reply to Jo Haylen is reflected in his Department’s policies, procedures and supporting documents FIRIS will be calling upon its supporters to participate in direct actions over the coming weeks and months aimed at ensuring the rights of all students and their parents/caregivers are respected in the 2019 school year. It’s time to make it very clear, it’s not a ‘yes’ if it’s not a clear and informed ‘yes’. The UK is undertaking to review Religious Education (RE) in UK Government schools. 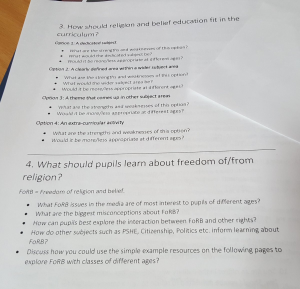 In the UK, RE is legislated to be provided by all government schools and it is supposed to be a fairly comprehensive programme, teaching the study of different religions, about key religious leaders and religious and moral themes according to local and national guidelines. 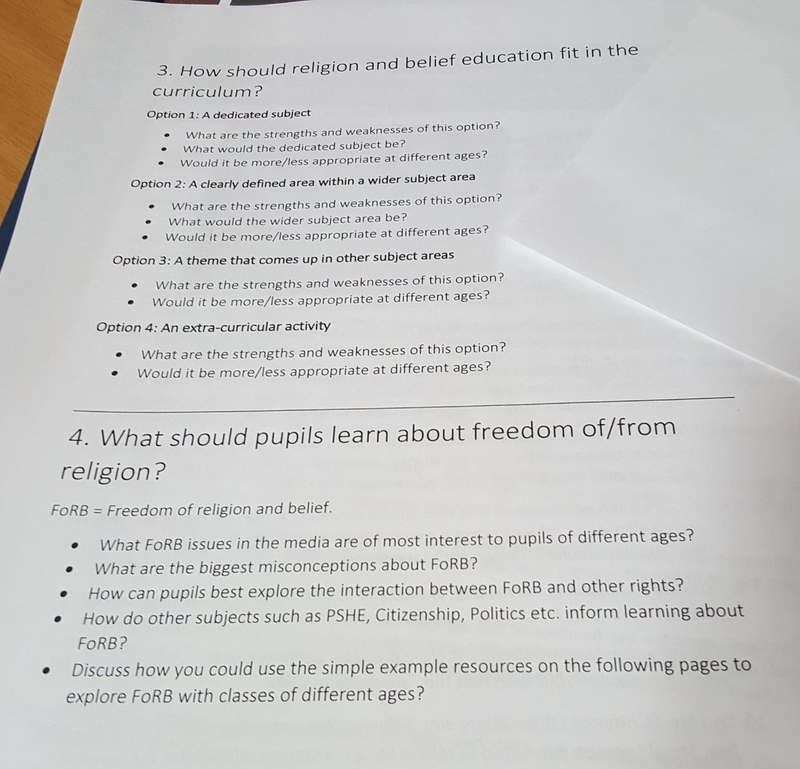 In reality it is only provided in approximately 75% of schools and in those schools it is often parochial: the curriculum is required to reflect the predominant place of Christianity in UK religious life, so Christianity forms the majority of the content of the subject. Moreover, RE is determined and provided by local ‘Standing Advisory Councils on RE’ aka SACREs. A preliminary report was published by the REC Council of England and Wales in late 2017. The same council had published a review in 2013. 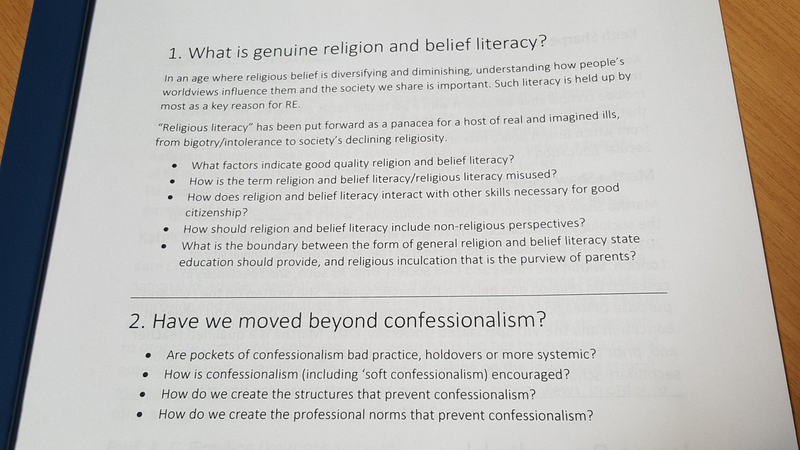 “Although Religious Education (RE) is a legal requirement in UK schools, it is an oft-neglected and misunderstood subject. It is important to seriously re-think this key subject at this time of low religious literacy and rising extremism, to protect communities from the consequences of hatred and misunderstanding. This book promotes a public discussion of what exactly is needed from a new model of RE within our education system to benefit wider society. The UK National Secular Society has recently provided commentary and conducted a one day conference on Saturday 14 April 2018. RE should reflect the real religious landscape: the importance of understanding the “dynamic and changing real religious landscape”, recognising that there is more believing without belonging, and [various] ways of ‘not believing’. There was reference to “the risks of a narrow knowledge focus to the RE curriculum” and “an accountability structure that emphasises it”. There needs to be a change to the legislation around RE. One panelist excoriated the arbitrary postcode lottery of [locally determined] syllabuses & the ‘inbuilt religious prejudice’ that [often] provides … if RE can be guaranteed to be objective, critical, and pluralistic then the parental right to withdraw their child from the subject should be removed [withdrawal from RE has increased in recent years, often by Anglo-Saxon parents withdrawing their children from the Islam components of RE]. RE should be taken out of the hands of faith & secular belief communities in order to uphold its legitimacy (RE is increasingly being controlled and dominated by faith communities). AC Grayling gave a keynote speech calling for teaching about “the history of ideas”. One thing that was brought up in the table discussions was a necessity to teach [not necessarily in RE, but in PSHE/citizenship] the basis of [discussing] ideas, not the people that hold them: [to] get it in a respectable academic structure. In recognition of Harmony Day FIRIS would like to take the opportunity to remind parents and caregivers of children in NSW public schools, that special religious education (SRE – aka ‘scripture’) is not, as the scripture lobby would like them to believe, a ‘celebration of diversity’. During the time allocated to SRE, students participating in SRE are separated from non-participating students, divided up and provided with faith instruction from a single religious persuasion or denomination or from a combined arrangement made up of various denominations. 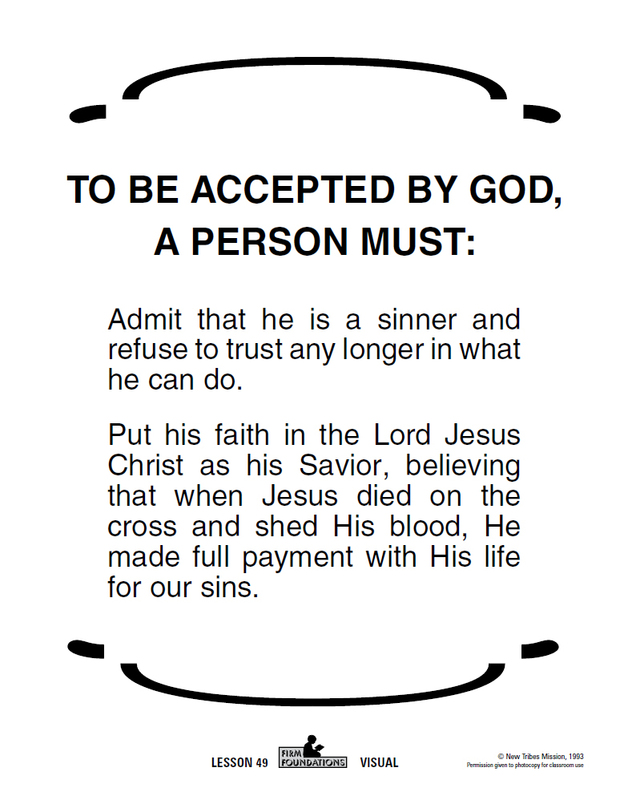 This faith instruction is not, and cannot be, provided by on-duty NSW Department of Education-employed teachers. It is provided by paid or unpaid representatives of religious organisations solely authorised by those organisations. The Department also has no say in what is taught or how it is taught. 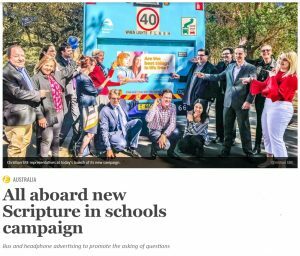 Close to 90% of the 100+ religious organisations approved by the NSW Minister for Education to provide scripture in NSW schools are Christian. The 2015 independent review of scripture and ethics stated that of the 11,418 SRE instructors reportedly entering NSW public schools over 90% were Christian. It is important that parents and caregivers do not confuse SRE with ‘general religious education’ (GRE). GRE is ‘education about the world’s major religions, what people believe and how that belief affects their lives’. It is taught mainly through the authorised school curriculum by Department of Education-employed teachers in an inclusive classroom setting. But if there was any doubt that the scripture lobby’s claim that the divisive system of SRE is a ‘celebration of diversity’ is nonsense and a classic example of Orwellian 1984-esque ‘double-speak’, meet Pastor Keith Piper of Liberty Baptist Church. Liberty Baptist Church is approved by the Minister for Education to provide SRE in NSW public schools. Pastor Piper has also been a candidate for Reverend Fred Nile’s Christian Democratic Party in past NSW State elections. Here is Pastor Piper speaking at the ‘Stop the Islamic School Rally’ in Penrith’ in May 2017. 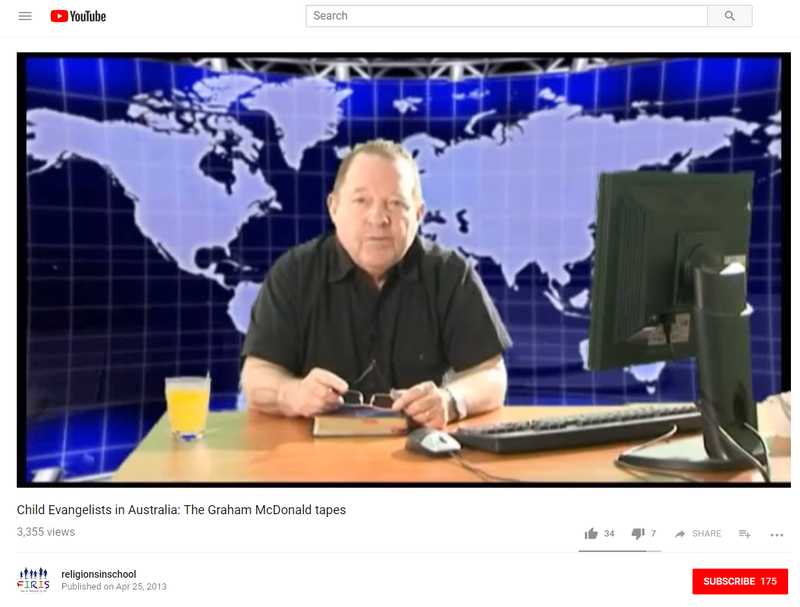 Another YouTube video, his presentation ‘Incompatibility of Islam & Christian / Western values’ at an Australian Christian Nation Association’s forum (apparently hosted by Fred Nile in 2016), has been removed for violating YouTube’s policy on violent or graphic content. 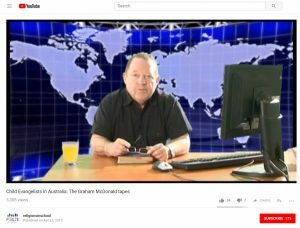 FIRIS’ concerns after viewing the website of Liberty Baptist Church and the YouTube videos mentioned above, formed the basis of a complaint to the Minister for Education regarding the ongoing approval for Liberty Baptist Church to provide SRE in NSW Government schools. FIRIS questioned such approval given Pastor Piper’s activities and the messages promoted by him in the context of the Multicultural NSW Act 2000 and numerous Department of Education frameworks, policies and procedures, including the Values in NSW Public Schools Policy, the Multicultural Education Policy, the Controversial Issues in Schools Policy, the Community Use of School Facilities Policy, and the Wellbeing Framework. See below for a copy of FIRIS’ letter to the Minister. Please note that some screenshots from Pastor Piper’s ‘Incompatibility of Islam & Christian / Western values’ presentation included in this letter to the Minister have been censored due to their graphic and violent content, including beheadings, executions, and female circumcision. 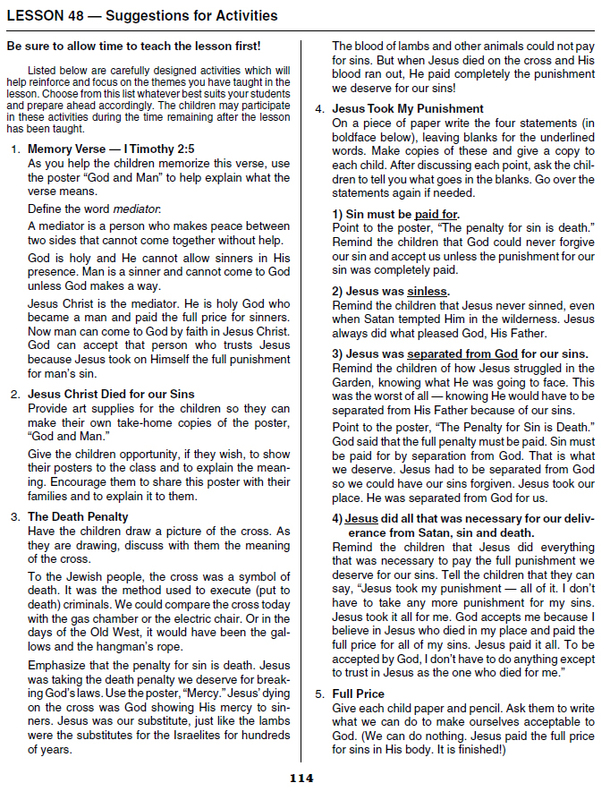 However, in order for readers to have an idea of the content of the images used in Pastor Piper’s YouTube video, the censoring is kept to a minimum, and therefore FIRIS still feels that it is necessary to warn readers to exercise their own discretion before viewing page seven (7) of the letter to the Minister. SRE apologists might try and defend Liberty Baptist Church by claiming that what Mr Piper thinks is not a problem because its SRE instructors are required to follow the SRE curricula authorised by Liberty Baptist Church, including the Sydney Anglican’s Connect curriculum. 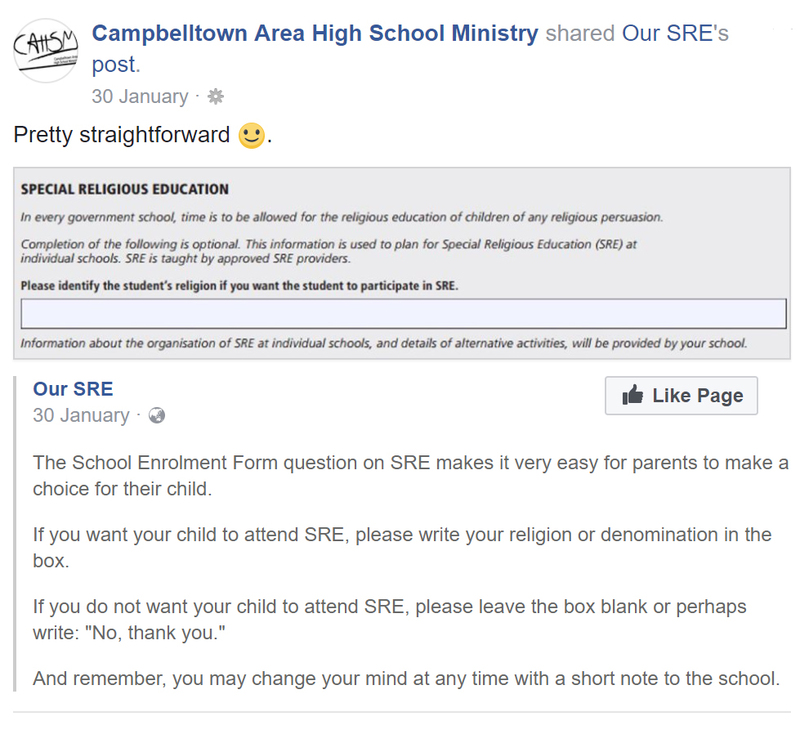 However, the problem with Liberty Baptist Church’s approval to provide SRE to NSW public school students is what the Department does not tell parents and caregivers is allowed to occur during SRE lessons. SRE and VSA volunteers may inform the students who participate in that SRE class or VSA group of related extra-curricular activities including local church groups. This statement does not seem to be present in any documents published by the Department related to the provision of SRE. This fact in itself demonstrates a profound lack of respect by the Department for the rights of parents and caregivers to informed choice and decision making. 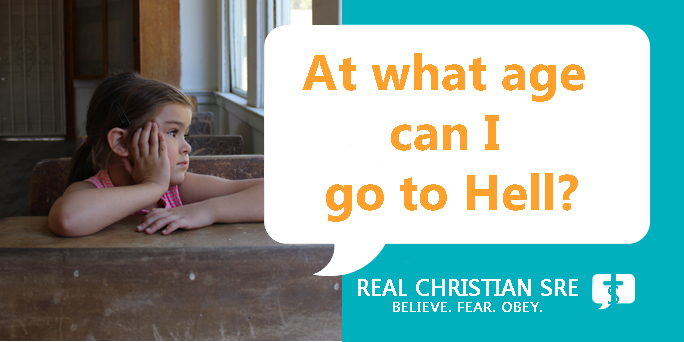 In consideration of the messages their children might be exposed to by attending extra-curricular activities provided by Liberty Baptist Church, the Minister’s approval for Liberty Baptist Church to use NSW public schools as a means to attract young people to his church should be of grave concern to parents and caregivers. Furthermore, the foreseeable risk that representatives of Liberty Baptist Church will not stick to the curriculum is high given that it has been reported that Pastor Piper was asked to stop teaching religion classes at Macarthur Girls High School in Sydney’s west in 2005 after a Muslim student complained about his comments on the Quran. Liberty Baptist Church is an approved provider and has met the current requirements to maintain approval. In doing so, the Minister and his Department have clearly demonstrated that the provisions for scripture in the NSW Education Act 1990, dating back to at least 1880, create a black hole in the NSW public education system where the spirit, principles and standards of other pieces of legislation, such as the Multicultural NSW Act 2000, and the Department’s own frameworks, policies and procedures are suspended or intentionally ignored in order to retain SRE in NSW Government schools. It is time for the Minister to stop placing the self-interests of religious organisations over and above his duty of care to all NSW public school students. It is time for him to pull his head out of the 1800s and to bring an approach to inclusive religious education developed by accountable education professionals which is appropriate to Australia’s 21st Century multicultural and multi-belief society.